Old Mr. Webster never imagined a dictionary like this! More than just word look-up, this dictionary software provides on-screen translation that tells you the type of word, gender (male or female in Spanish, for example), verb conjugation, and some common usages of the word. The program also defines phrases and expressions that often can't be translated word by word but need an understanding of the language's idomatic quirks. 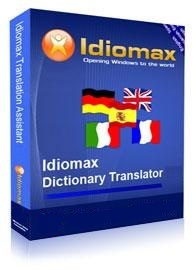 IdiomaX English to Spanish dictionary is the software that can actually help you learn, not just translate, a language. Once you've downloaded the software (Windows compatible) you'll have a new translation bar on your screen. Whenever you encounter a word or phrase you want to translate, simply drag and drop it into the translation bar. The English to Spanish dictionary can be used with whatever application you have open. This product functions as an English to Spanish dictionary and Spanish to English dictionary. Another module is available to conjugate verbs in English, Spanish, Italian and French.